Tired of the same old soft-play parties, magicians & entertainers and looking for better children’s party ideas?! If you are looking for a unique children’s party with a truly magical atmosphere then a party at our Castleford or Milton Keynes venues are ideal! Our children’s parties allow you to create long lasting memories with the magic of real snow! We have great experience of delivering outstanding children’s sledging and snowsports parties every day of the week, including freshly prepared food and a designated party host. Your party will be welcomed to Snozone by your party host, who will look after you the entire time you are here. Your party host will take you to your party room and help to get you organised for your slope time. Unlike other venues we will only have one party running at a time ensuring exclusive use of the party room. After an exhilarating session on the real snow slopes your party host will collect the group for a birthday meal, during which the birthday boy/ girl will be seated at the head of the table on their “Snothrone!”. A great sledging session on real snow! Freshly made hot meal for the children! Dedicated party host, just for you! 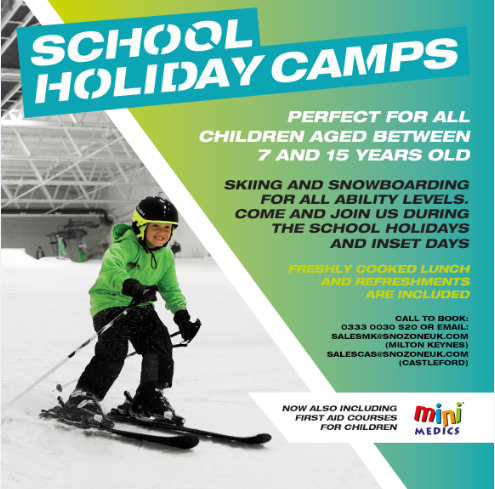 Sledging and/or a fantastic ski or snowboard lesson on real snow! Dedicated party host just for you! Sledging & ski or snowboard lesson £39.99 per person. For more details about organising a skiing party or a sledging party for your child, or to discuss any children’s party ideas, please email sales.mk@snozoneuk.com (Milton Keynes) or sales.cas@snozoneuk.com (Castleford) with your name, telephone number and details of your enquiry. We will contact you within 48 hours.